Love this! I find it interesting that mushrooms are neither a plant nor animal yet are more like an animal. I think they are aliens! Another morning smile. Thank you. Means a lot! Thank you, Mitza! 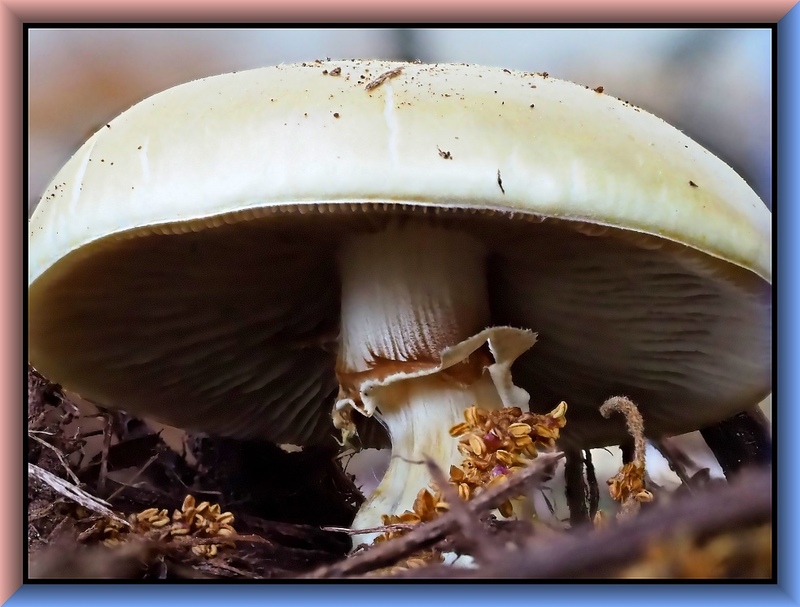 🙂 We are finally getting plenty of rain!… so maybe more mushroom shots could happen. Touching verse and another great shot, Tom. Superb photo (as always) and a delightful poem, thank you Tom. Great Picture. One can almost imagine the little people living under there. Wonderful photos and a very appropriate haiku! Thank you, Berna! 🙂 Yes, in these times of division and hatred! Simply and beautifully said Tom. Very nice, the words and the picture – that large cap/umbrella will protect a lot of brethren. I’d happily huddle beneath this one; it looks quite inviting. It’s also a reminder that the best photos sometimes require a good bit of “huddling” on the part of the photographer. I’m pretty sure this wasn’t growing at eye level!